Long ago, in the ancient days of the Internet (meaning nearly twenty years ago) search functions were somewhat less . . . selective than today. It’s hard to describe to anyone who didn’t experience it in that era, but it was easy to come across such things as might make the HR department decide to call you in for a chat. When I started teaching my mother how to use the Internet, she got very frustrated with this particular aspect of cyberspace. I happened to make her a St. Michael Prayer wallpaper for her laptop, and she said unwanted search results were significantly less likely to pop up after that. Since then, she’s always wanted that kind of background on any Internet device she uses. A few days ago, she asked me to make her a new one, but with the words of the Act of Contrition on it. Now, I’m not skilled with stuff like Photoshop, but I can slap words over an image, an I thought I’d share it with you all. This is, obviously, not sized for multiple types of monitors. (If anyone wants to do a better job, I’ll happily replace it.) The image is of a stormfront; I decided to go with that weighty sense of trouble, and this particular image is free for noncommercial use with alterations. Best wishes and prayers for a productive Lent, from all of us here at The Catholic Geeks! 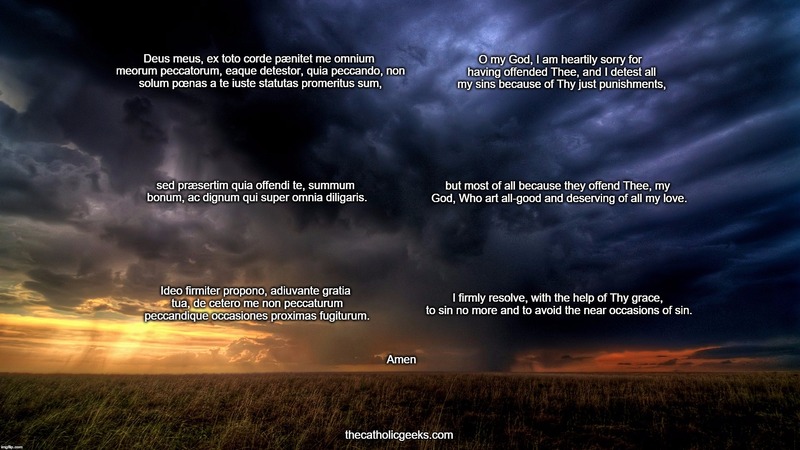 This entry was posted in Resources, The Church and tagged Act of Contrition, Lent, Wallpaper. Bookmark the permalink.